Russia's favorite beverage turns 152 today. True, that doesn't mean that Russians haven't been toasting each other under the table since centuries before that, but it was 1865 when vodka joined bears and matryoshkas as an eternal symbol of Russia. Any birthday deserves a toast. Or in this case, ten of them, each with a vodka-related trivia item to chase it down. Whether you decide to toss back a vodka with each one is up to you. (Note: we don't recommend it). January 31 is known as the birthday of Russian vodka. The beverage had already been a favorite import, but on this day in 1865, the chemist Dmitry Mendeleyev defended his dissertation. Titled “On Combining Water and Alcohol,” it might sound more like an extracurricular activity than a doctoral treatise, but it gave rise to the 40% of alcohol content that became the state standard for vodka production – all thanks to Mendeleev’s calculations. In fact, vodka is water. Etymologically, at least. Вода (voda) is Russian for water, and Russian diminutives are formed by adding the suffix “ка” to nouns (or similar variations on the suffix, depending on spelling rules). So vodka, literally, means “little water.” Isn’t that cute? More history: when the word “vodka” first showed up in Russia in 1533, it described a medicinal beverage. That’s how it was marketed by Genoese traders who brought bottles of so-called aqua vitae, or “water of life,” to the courts of Russian rulers as early as the 14th century. It helped heal their pain – and then some. Vodka may be little water, but it didn’t get its distinctive flavor (or what you may think of as lack of flavor) until Mendeleev came along. When you see references to vodka in diaries or literature (for example, when Yevgeny Onegin sips on it in his eponymous novel in verse by Alexander Pushkin) before the second half of the 1800s, there was some sort of flavoring involved. Flavored vodkas are still common today. That may mean things like pomegranate or whipped cream in some U.S. brands, but pepper, cranberry, and horseradish are much more common Russian flavors. A few rules of vodka consumption. If you’re taking a shot, make sure to hold your breath and drain your glass (called a рюмка, or ryumka) all in one go. It’s just what you do. 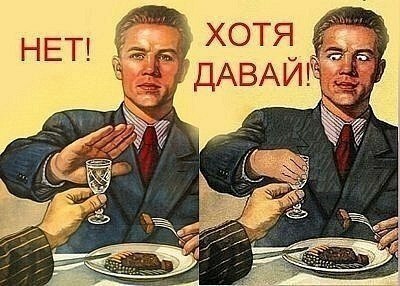 You can also say “Давай!” (davai), Russian for “Let’s!” or, in this context, “Down the hatch!” It’s also the title of a book all about the history and habits of Russian vodka. Better yet, Russian Life’s got a copy for you. Vodka is responsible for Russia’s history of autocratic governance. At least, that’s the argument made by Mark Lawrence Schrad in his book Vodka Politics. Schrad argues that many Russian rulers have used vodka to drink their close cadres into complicity – and tax their subjects into subjugation. It’s a provocative argument, but an intoxicating one. Smirnoff is the world's top vodka brand, and it has at least a few fun facts worth mentioning. After founding his distillery in Moscow in 1864, Pyotr Smirnov boosted sales through newspaper ads and charitable donations to priests – a good tactic to quash anti-drinking sermons. Fleeing Russia after the Bolshevik Revolution of 1917, the Smirnovs worked to sell their vodka abroad. Their most successful U.S. campaign: marketing vodka as "white whiskey" with "no taste, no smell." It helped sway American whiskey drinkers and paved the way to the supremely non-Russian Smirnoff Ice. Well, it was created in 1954, which was not a time of state-ordered prohibition, but was part of an anti-alcohol campaign under Khrushchev. The main periods of official prohibition in Russia were under Tsar Nicholas II in 1914 – with the goal of fewer drunken soldiers in the military during WWII – and a partial prohibition by Mikhail Gorbachev from 1985 to 1987. In both cases, the production of boot-leg alcohol rose, and with it, deaths from drinking things that shouldn't be drunk. Come to think of, major shifts in Russian politics came on the tail of each prohibition effort. New historical theory, anyone? Vodka has many uses. Clean your spectacles. Kill mold and mildew. Wash your face or hair. Treat dandruff, earaches, fevers, cold sores, jellyfish stings, toothaches, or foot odor. Oh yes, there's more where that came from. Drink responsibly. There are a lot of dismal statistics about alcoholism in Russia (and elsewhere). A study in The Lancet found that, between 1980 and 2010, 25% of Russian men died before age 55, a majority from alcohol-related causes. Another grim one: in 2011, the average Russian adult drank 13 liters of pure alcohol per year. Eight of those liters were spirits, and the key culprit: vodka. But with new liquor regulations in place as of January 1, 2017, that trend may be on the downturn, with Russia seeing its first decline in alcohol poisoning in the last five years. Cheers to that! So grab a ryumka, pour a glass (make sure it's the pure stuff), and make sure you've got your pickles handy. За здоровье! Cover image: press.lv. Text: "No...Or rather, down the hatch!"